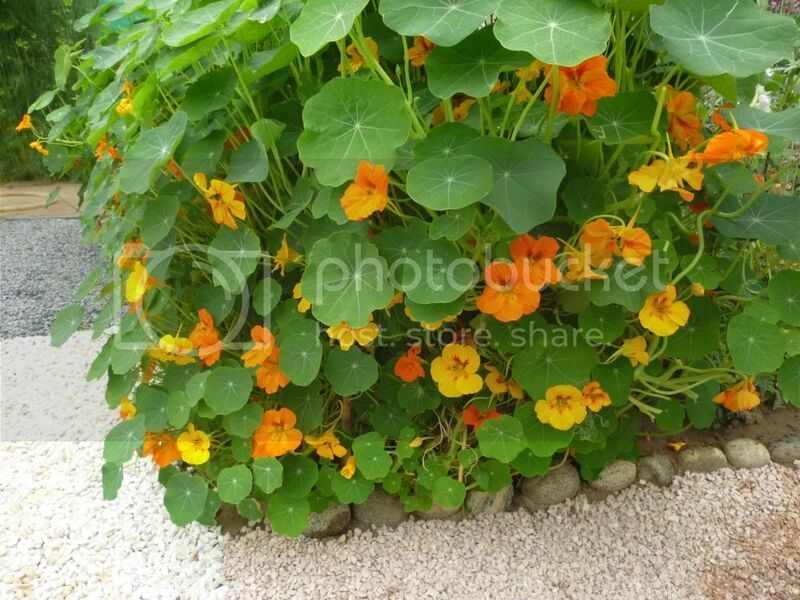 Uses The dwarf, bushy nasturtiums add rainbows of cheerful color in annual beds and borders. Other Details Nasturtiums are bright and happy little flowers, that even the Grinch could not help but love. Many cultivars have been derived from Tropaeolum majus, including climbing types and dwarf, bushy types. All have rounded or kidney shaped leaves with wavy-margins. The leaves are pale green, about 2-5 in (5.1-12.7 cm) across, and are borne on long petioles like an umbrella. The flowers typically have five petals, although there are double and semi-double varieties. The flowers are about 1-2 in (2.5-5.1 cm) in diameter and come in a kaleidoscope of colors including russet, pink, yellow, orange, scarlet and crimson. A white flowered cultivar was bred in the 19th century but apparently has been lost. The five sepals are united into a cuplike calyx, and one of the sepals is modified into a nectar-bearing spur 1 in (2.5 cm) or more long. All parts of the plant have a peppery taste, similar to arugula or water cress.Garden nasturtium does best in light, sandy soils. Too much nitrogen fertilizer will produce an abundance of foliage and few flowers.Does well in full sun or light shade. Nasturtiums appreciate a little midday shade in summer.Nasturtiums are fairly tolerant of drought, but do best with regular watering. Nasturtium should not be fertilized at all...Poorer the soil, better they will perform. If fed good (Water & fertilizer), they will have lot of foliage but less flowers, also because flower will be hidden under the foliage. They make a very good Mound. Pinching leaves will promote further bushier growth. They can tolerate light frost. Nasturtiums are early to flower in Spring as compared to other Spring annuals and will be last annual flowering along with plants like Petunias and statice. Seeds should be soaked in water for few hours before sowing to enable quick germination. Nasturtium very much dislike transplanting(unless started in individual plugs).....Sow in situ and they will amaze you with their performance. Another way of deadheading Nasturtiums is to cut back the entire plant. They will respond in a week with fresh growth. In this way their season can be further increased. Importantly, Nasturtium seeds can be harvested at any time. They will not dry out(or take ages)....as soon as you see a green pea like seeds (pod having 3 seeds) it can be harvested and stored. Vines or Rambler type specie is also available. Nastrutium seeds should not be saved in plastic bags as they contain lot of moisture. Paper envelopes/Bags serve the purpose well. Let the seeds dry at a shady place for couple of days to ensure that they are moisture free. Nasturtium can be sown as early as October. Where can I buy seeds for this plant and what is the best season to plant. They are so friendly that they will come back even if you do not want them, lovely foliage lovely flowers look best when hanging.